Did you know that there are five commercial pipelines running underneath Placitas—some as old as 60 years? These single-wall pipelines move toxic materials like butane, crude oil, and gasoline under extremely high pressure, and if one was to leak or rupture (as pipelines often do), it could spell disaster for Placitas. 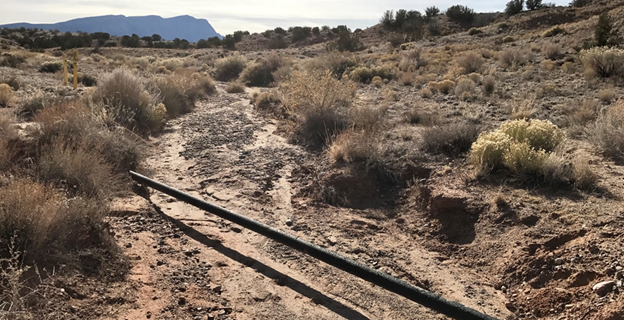 Recently, two pipeline operators applied for and were granted permits by Bureau of Land Management (BLM) to increase operating pressure without public comment. LPA feels this decision puts Placitas in an unfair, unsafe situation. To make matters worse, we have four (4) high pressure pipelines running in our most active creek, Las Huertas Creek and crossing 34 other arroyos where they become exposed when water runoff carries away the soil that is supposed to keep them buried. Once they are exposed they are susceptible to being ruptured by the rocks and other debris being washed over them, further increasing the likelihood of an eventual rupture.